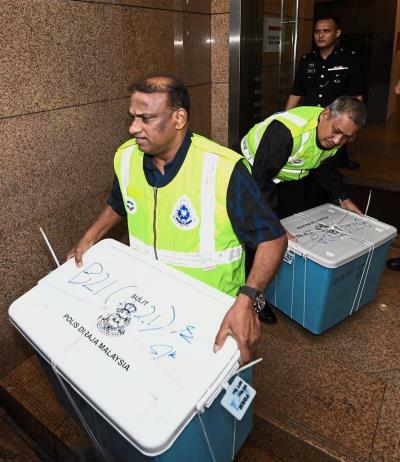 PETALING JAYA - The cash in various currencies seized from the Pavilion Residences last week has reached nearly RM130mil (S$43.8 million) as investigators finally concluded the counting task. Sources said officers from the Bukit Aman Commercial Crime Investigation Department (CCID) completed the painstaking task of counting the seized cash at its headquarters at Menara 238 along Jalan Tun Razak yesterday. "The process of counting the cash started on Monday as investigators pulled long hours just to ensure the process was done thoroughly. "Some 35 bags of cash were counted by police personnel with the assistance of Bank Negara officers," a source said. The bags of money were among 284 boxes filled with designer handbags, watches and jewellery seized from three luxury condominiums here, the value of which is impossible to estimate due to its sheer volume. The sources said the jewllery could worth in the region of RM200mil. However, police will appoint a professional valuer to determine the exact value of the jewellery and other valuables. The raids were part of police investigations into 1Malaysia Development Bhd (1MDB). When contacted, Bukit Aman CCID director Comm Datuk Seri Amar Singh refused to comment on the amount of cash counted so far. "I cannot comment on the amount of cash that have been counted. "I will hold a proper press conference to address the progress of the investigation," he said. It is learnt that the police were also assisted by other agencies, including Bank Negara. Other sources have also been reported as saying that the process of counting the money was very tedious as it involved multiple denominations and every banknote seized had to be recorded. Last Friday, police seized all the items and cash following a check on six locations linked to Najib, including the Prime Minister's Office, his official residence as well as other premises.